I'm new to the forums here. I have a 2009 Corolla LE with 44,000 miles on it which I purchased used a year ago this month and this is my first Toyota I've ever owned. So far, I think it's the best car I've ever had. On Friday morning as I was about to go to work, I turned the key in the ignition to start the car and nothing happened! No sound, but all the dashboard lights lit up. I had interior and exterior lights full strength, so I didn't think it was the battery. I ended up having the car towed to my mechanic a couple of miles away. When I picked up the car, the mechanic told me that the car's ignition computer had to be reset and the car starts without any problems now. He told me that if this happens again (which I hope it won't) that the easy fix to cure the problem would be to disconnect the battery for 10 minutes, reconnect it and then punch the lock/unlock button on the key remote a couple of times and that should fix it. 1) What would cause the engine/ignition computer to make the engine not start? 2) Would the computer that controls this function need replacing? I was told that the dealer would charge around $1,500 to do this. This is the first time my car has ever done this since I've owned it. It does appear to be a common problem with 10th generation Corolla. The ECU eventually needs to be reset after it's parked for a certain time. CorollaS2011: "I had a no-start issue with my corolla. Got up one morning hit the key and it just cranked and cranked. Checked the battery ... seemed fine... took battery to Sears and tested fine. Put battery back in car. Checked all electrical connections and fuses... no problems. No start. Left car overnight with battery disconnected and it started up a bit rough the next morning and then no problems now for weeks. Took it to the dealer and they checked it out for two days straight, no problem at all and it's been starting as usual for weeks now. I was told by the dealer that every once in awhile they get a car that does this and then never does it again... ever. Hope this is my one shot at this as I lost most of a day of work because of it. One of the guys at my job was a former import technician with extensive Toyota experience. He said that once in awhile they found a Toyota that would do exactly what mine did and it was the computer programming. It would get lost for awhile and if you left the battery disconnected for a few hours and retry it, it would start. After testing I had left my battery disconnected overnight before hooking it up on Monday to try it before calling the tow truck. It started right up. He went into a big explanation as to why this happened but evidently the Toyota has a program routine that watches how long a car has been shut off and slowly starts shutting different systems off such as radio memory, etc that continually draw power from the battery trying to save the battery for a restart of a car that's left turned off for a long period of time. Evidently the system gets lost as to how long the car has been sitting without being started and starts turning off different systems trying to save the battery before it goes completely dead. In this case it evidently decided (incorrectly) the car had been sitting a long time ( in reality only two days) and shut everything off. Leaving the battery disconnected for overnight as I did forced a reset of the system so when I tried it the next morning it started right up and has been going great ever since. The reason it didn't start up after I removed the battery for testing and reinstalled it was that it was only for about an hour for testing. He said it had to be at least 2 hours or more before it would reset. No way to tell if this is it, but I'm only passing on what I've been told. The dealer said something similar and that they have only had this happen once with each car with no repeats. Hope they are right!" Thanks for this information! If it happens to me, I'll know what to do. Actually, in dmp's case, I think it would be a bad battery. 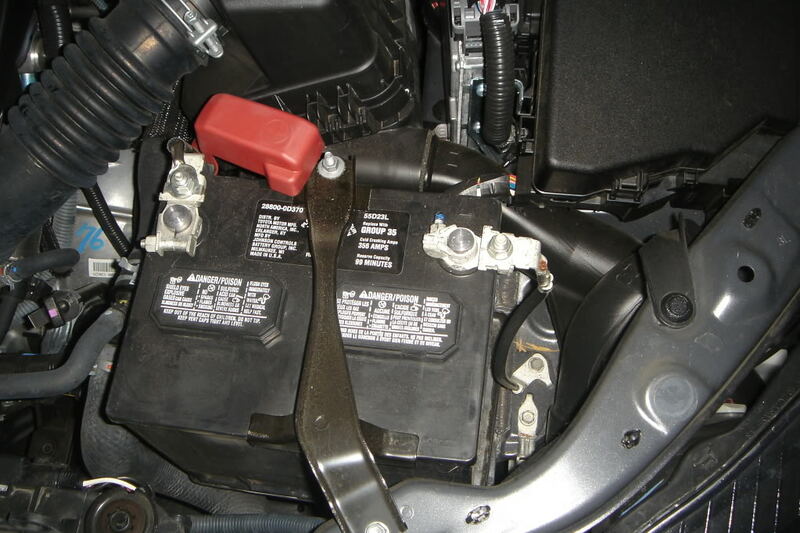 Start by removing your battery connections to clean them and the battery poles, then make sure they're good and tight. Your 2009 LE's original battery is now over 6 years old. Try getting a good 640 CCA battery. Also don't forget the battery in the keyless remote as well. When my 2009 Matrix batteries went out, I also had a no start condition. Remember these have the chipped keys, should be able to be powered by the inductive coil on the ignition, but sometimes it doesn't always have enough juice to get a clean read on the code. Replacing the lithium coil battery in the remote "seemed" to have cured it. When I opened the hood and took a look at the battery, it seemed that all was in order. The terminals were clean and connected tightly. But, as you said, this is the original battery going on 6 years old and it would be a good idea to replace it sooner rather than later. I never would have thought of doing that, so thanks for this helpful tip. I'm hoping this is a one-time fluke. It's been a week since this happened and the car starts each time without any problem. I replaced the battery this morning just for my own peace of mind. I got an Interstate battery similar to the one in the link above. I had my mechanic check out the old battery and he said it's still in good shape, so he kept it. It was a DuraLast battery, which I've never heard of. Is DuraLast original equipment on new Corollas? Anyway, the car has a new battery and no problems starting whatsoever. Similar? Is it a 640 CCA Group 35 Interstate battery? The Duralast would not be the original battery... Was it the regular blue lettering Duralast on red background sticker, a Duralast Gold, or Duralast Platinum? Original battery was made for Toyota by Johnson Controls USA... It was rated at only 356 CCA, and is no longer available.